Apartment, 2 Bedrooms + Convertible bed(s), 1 Bath, (Sleeps 4-5). 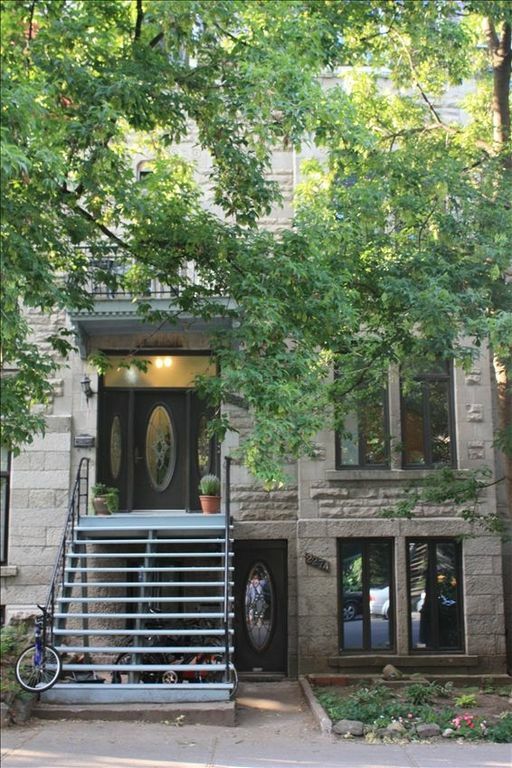 Located on a quiet tree-lined street in the heart of downtown. Walking distance to all the amenities downtown has to offer; 15 minutes on foot to Crescent Street, the heart of Montreal's nightlife; 5 minutes to the metro which can take you to the Old Port, the Latin Quarter, and the Biodome in less than ten minutes. The Lachine Canal (boating, biking, fishing) is just down the street by the Atwater market, and theatres, shopping and restaurants are around the corner. Eat-in kitchen with all the necessaries for cooking. BBQ on balcony. Queen and double beds as well as single futon. We are close to the highway - the Laurentian Mountains (skiing, hiking, fishing etc,) and the charm of the Eastern Townships are less than one hour away. We have lived in downtown Montreal for 20 years and enjoy every second of it. Our house is on a quiet, tree-lined street, and at the same time right in the middle of all that downtown living offers: easy transportation, universities, shopping, nightlife, museums - it's all at our doorstep. We keep on profiting from the immediate access to entertainment, education, and transportation. Can life get any better. We inherited a four-plex house in the downtown area and decided to convert two of the apartments into a vacation rental. Everything is provided - sheets, towels, soap, shampoo, BBQ, washer-dryer, etc.- just bring your toothbrush. Private parking, cable TV and high speed internet is included. All the downtown core has to offer (restaurants, shopping, theatres, etc. ), yet situated on a quiet, dead-end street. Fully equipped eat-in - microwave, electric kettle, pots, pans, coffee maker, dicers and slicers - it's all there. steps, but it was always looked after, which I appreciated very much. The property is very well maintained. It is in a great location. Close to downtown and yet very quiet. Private parking at the back of the property helps a lot, given the parking restrictions on street parking in Montreal. I would highly recommend this property. Luda was responsive and helpful. Home was comfortable, clean and spacious. I had all the amenities I needed. Property was pld but the owners were there to greet us and brought breakfast the first day of our stay, and gave us hints about getting around. Couldn’t be happier with our stay. Oleg was so helpful and thoughtful! The apartment had all you need and more and was very close to two metro stops and the Atwater Market. Great place! The apartment is very spacious and well equipped. The location is only 10 minutes walk from the Metro (Atwater) which makes getting about very easy. Almost next to the Metro is an excellent supermarket called Adonis which was recommended to us by Luda - and we endorse that - very good choice. Only a few doors along Rue St Catherine from Adonis is a Turkish restaurant called Avesta which we loved - delicious food, and excellent Turkish wine! Our Montreal highlight was the Sauté-Moutons jet boating on the St Lawrence - fantastic, exhilarating and very very wet. "biodome","science center", "Old Port", "farmer's market", Mount Royal, Atwater market, Lachine canal, Montreal Museum of Fine Art. Montreal Museum of Modern and Contemporary Art.